Day one of officially being in a PhD program as I start my prerequisite course. My nerves are high but but I REALLY love the material we're covering so far. I'm almost finished with my business degree-just a few terms left. With the two programs overlapping a bit, my summer and fall will be INTENSE. It still hasn't completely sunk in that I'm getting a PhD. It's truly a dream come true. 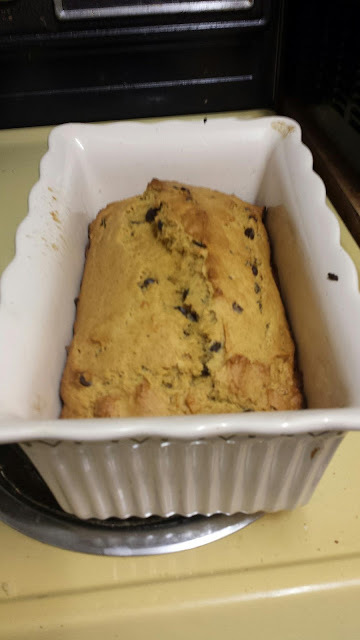 To deal with some of the stress today, I baked some pumpkin, banana, chocolate chip bread. I grabbed the recipe from Jessica at Together as Family and will be sending it to my pen pals. It's pretty delicious!